Great when chasing trout, bass and other clear water inhabitants with spinning gear, the Magic Bubble Spin Floats have a clear design which makes them less visible to fish under the surface. 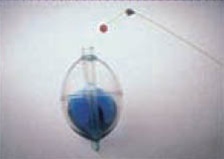 Although the clear design reduces the float's visibility under the water, the Magic Bubble Spin Floats are still easy to see and watch on top of the surface. Magic Bubble Floats float high and are made extra strong.